Amazon Price: $221.98 (as of October 18, 2017 7:46 am - Details). Product prices and availability are accurate as of the date/time indicated and are subject to change. Any price and availability information displayed on the Amazon site at the time of purchase will apply to the purchase of this product. 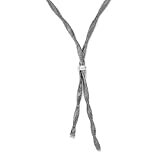 A unique lariat style necklace featuring a 3mm textured and twisted design fashioned from polished sterling silver. It is adjustable in length from 17 to 20 inches and closes with a fancy lobster clasp. Made in Italy.